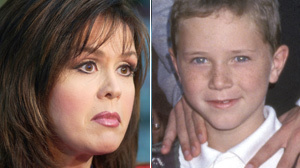 The death of Marie Osmond's 18-year-old son, Michael Blosil, who took his life last Friday after struggling with depression for years, highlights teen suicide in the United States. Suicide is the third-leading cause of death among older teenagers in America, according to the National Institutes of Mental Health, and boys are four times more at risk than girls. Family therapist Terry Real, the author of "I Don't Want to Talk About It: Overcoming the Secret Legacy of Male Depression," said any time something like this happens, "it just makes you shake your head. ... It's very hard to predict. "We know from research that girls tend to turn things inward ... boys and men both tend to turn things outward," Real said. "So you look at not the depression per se, but the things the kid is doing to get away from it: Drugs and alcohol, acting out, along with feeling depressed." Blosil, who was a first-year student at the Fashion Institute of Design and Merchandising, jumped to his death from his high-rise apartment building in downtown Los Angeles. On the site where he died, people created an impromptu floral tribute just a short walk from the school where he was said to be majoring in apparel manufacturing. Online reports that Blosil sent a text message to a female friend before taking his life and left a suicide note in which he referred to a lifelong battle with depression remain unconfirmed. Blosil was one of Marie Osmond's eight children, and one of five whom the star had adopted. In a statement to ABC News, Osmond said, "My family and I are devastated and in deep shock by the tragic loss of our dear Michael and ask that everyone respect our privacy during this difficult time." In 2007, the year his mother and father, Brian Blosil, were divorced, Michael Blosil entered rehab as his mother reluctantly confirmed on the talk show "Larry King Live." "It's really hard," she told King. "My son is amazing. He's dealing with a lot. He's one of my kids. He's dealing with adoption issues, all kinds of things right now. He is the most amazing kid," she said, tearing up. "It's been a painful year." In 2009, Marie Osmond recalled the painful challenges of that time in her life on "Good Morning America." "I mean financially, children, my son and other things going on, you know, the divorce and custody and all that kind of stuff, then my dad passed away unexpectedly." Things did seem to be looking up for her son, as Osmond recently told People magazine. "I couldn't be more proud of him," she told the magazine. "He's got a 3.9 GPA in high school. He's looking at scholarships to some wonderful colleges." Real said that "These things can really seem to come out of the blue when kids are doing better. … It's very hard to predict." Parents should know the signs of depression to look for in their own children, he said. "I think with a teenager you're looking at any real radical changes of behavior," he said. "Changes in sleep, either more or less, in food, changes obviously in mood, loss of interest, difficulty concentrating. They feel depressed. They tell you they're depressed." He said that while it can be difficult to differentiate between normal moodiness in teenagers and depression, but there are signs parents can look for. "With the mood swing, the central word there is 'swing,'" he said. "So you want to look at severity, how bad is it, and you want to look at duration, how long is it. If a kid is depressed for more than two weeks you might want to think about an evaluation." "Depression is one of psychiatry's great success stories," he said. "Ninety percent of people report relief, but fewer than three in five ever get it. If you have any doubts at all that your kid might be mad, sad or bad … get him or her in front of a mental health professional."